Metal/Gold colors: They have a quite liquid texture but also they cover the surface perfectly with a couple of layers. This is specially useful when painting a Golden base-coat, because most of the Golden colors available have a too transparent consistency. They have an strange metallic and matt finish, what makes them look very realistic when painting old and rusted metals. Alchemy colors: These colors are a little bit more liquid tan the Metal/Gold colors, but they are more shiny. They don’t have the matt finish the others have, what makes them perfect colors to highlight, paint the edges or make scratches. In both Gold and Silver sets you have a silver or gold Alchemy color, which is brighter (White and Citrine Alchemy) and then there are another three Alchemy colors which are more colorful. Experiment making all the mixes! Don’t limit to use them as a color transition. 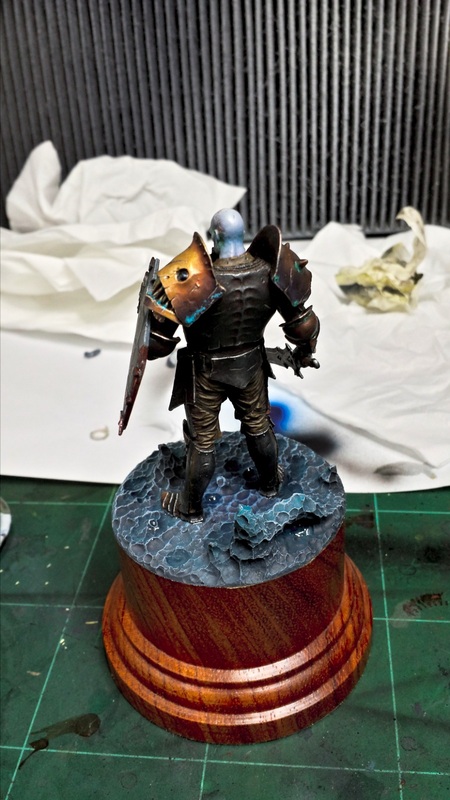 A good way to reach different tones is to use a Metal/Gold color as a base-coat and highlight it using an Alchemy color, and then shade it using a matt dark color mixed with the base-coat. The opposite way is to use a mix of a Metal/Gold color and an Alchemy one, highlight using the brightest Metallic or Alchemy color and shade it adding a matt dark color to the base. But also you can use it as a color transition, using a medium tone as base color and highlight and shade it with the other colors. If you don’t like to work with mat shadows just change it for the dark metal tone you want. These only are some ways to work with it. Your best way must be found by yourself. 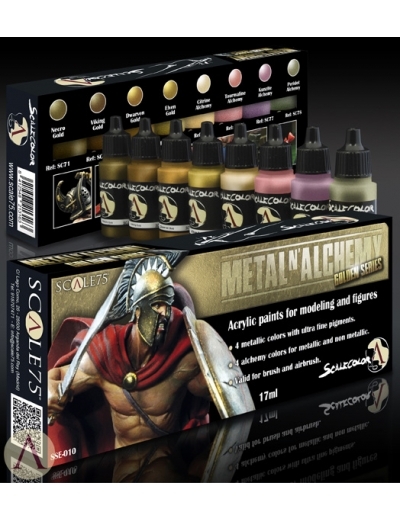 Try to make a lot of mixes with the colors of the set in order to find a good base-coat and different tones of metals. The waist part was shaded adding Black Ink to the base color. 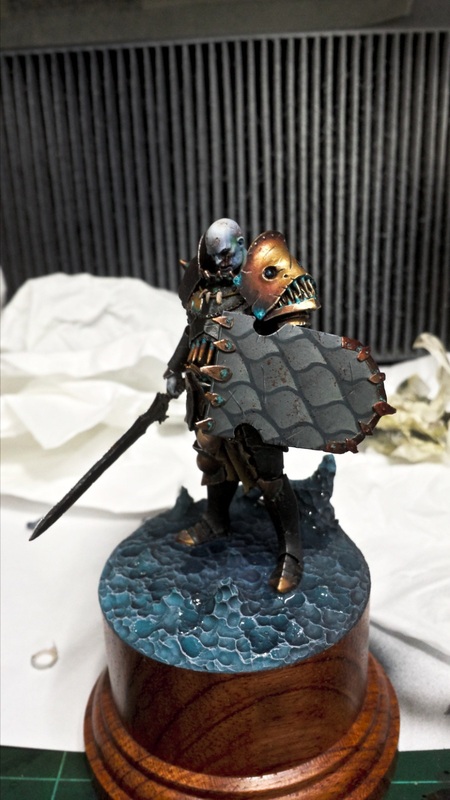 The metal looks much better with matt shadows so when painting them try to shade the base color adding a dark matt color to it (if you have any other paint set from Andrea or Scale 75, the darker colors work very good). Always highlight all the edges with White or Citrine Alchemy (or any metallic color brighter than the last highlight) and line the shadows with pure matt black or any other very dark color. It’ll give a lot of definition to the surface. Also you can add scratches and battle damage by this way. Adding dark matt glazes to the shadows once the scratches are painted will blend them into the surface and give a nice tone to the shadows. 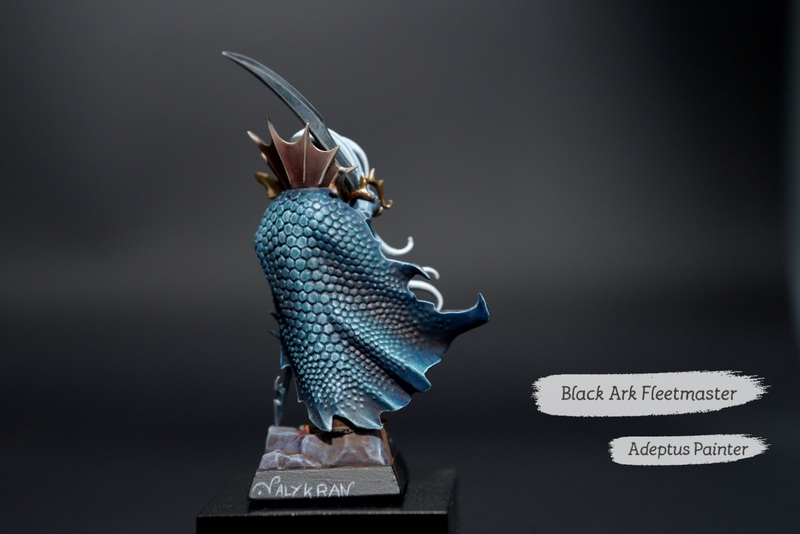 When painting gold, dark purple glazes look really good, and with silver, blue or brown looks nice too. I use inks from Andrea Ink Set mixed with matt black. Add texture to your metals. Metal surfaces are not smooth. When you paint the shadows try to add lines, dots and spots. Choose the surface and the technique. If you have to paint small surfaces is better to shade with inks or dark color glazes. True Metallics look much better in big miniatures. Metal rarely is clean. Add weathering and rust if it goes with the atmosphere. Remember that each metal has its own rust. I started with a Necro Gold base-coat. First I applied some shadows adding matt black (I used 3rd Shadow from Andrea Black Paint Set). I continued shading it until thought it was dark enough. I thinned all the shadows about 50% water 50% paint. For painting the highlights I added a little bit of Citrine Alchemy to the base-coat and painted light areas. Then I mixed the black color I used before with matt purple (I think the color is from the Andrea Red Paint Set) and painted several glazes over the shadows to give more depth and richness to the shadows. The last step was painting all the edges with pure Citrine Alchemy. Hi, here’s the new tutorial about how to paint realistic metals specially on big models. If you find it useful leave a comment. Hope you like it. More Infinity and Leviathan Crusader soon. Hi everybody. Today here you have the latest miniature I painted for my Infinity Morat Aggression Force army. I painted the entire model in one day, I felt motivated to paint it and I couldn’t stop until it was finished. I’m finishing the recording of several video tutorials so there’ll be new ones soon. Hi everyone. Today I’m going to announce some changes related to the blog and the Facebook page. Only two months ago the Facebook page started to get more visits and now we are more than 500 people. I’ve seen that watching content in Facebook is much easier and fast than in a blog and people prefers it. 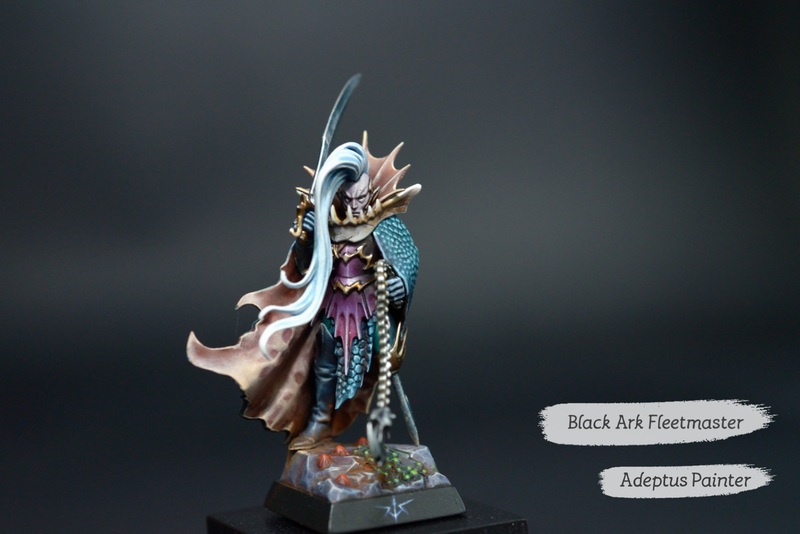 So I’ve decided to use this blog to publish only finished miniatures and long tutorials. I’ll try to publish some pictures on Facebook each day or each two days. Hi everyone. Everything is finally ready. I’ll tell you about my new project very soon. Today I’m showing you the new Hellbrute. The miniature is much better than the first which appeared inside the Dark Vengeance box. 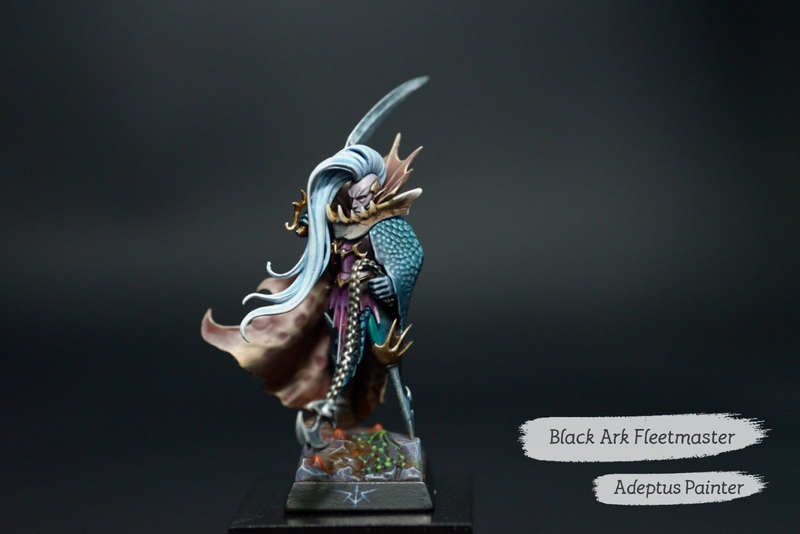 The miniature is awesome to paint and not difficult if you mix the use of airbrush and brushes. I’ve chosen a ver saturated pink-purple color. Metal parts are going to be mostly gold. This is because I’m trying the new Scale 75 True Metallic Gold paint set. 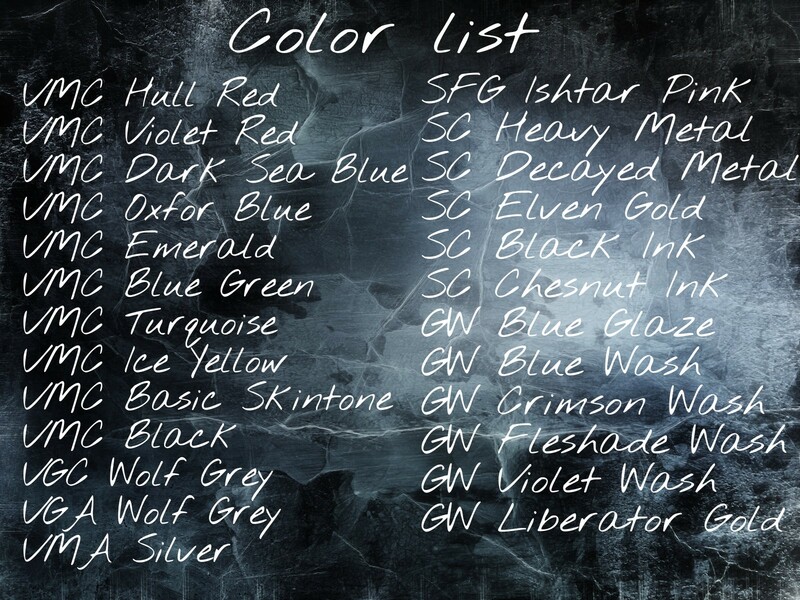 I already have used it a couple of times and it’s colors are for me the best golden ones. But I wont bore you with it. I’m making an article about how to use it. Hope you like the miniature. Comments are always welcomed. 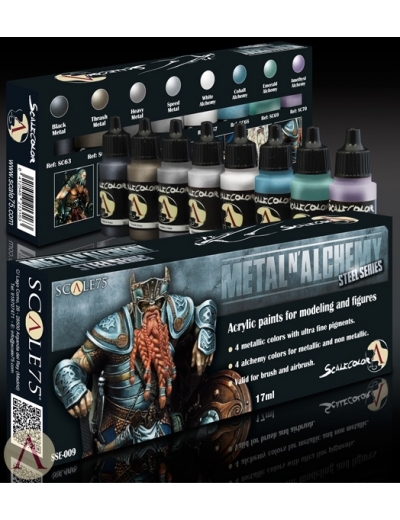 Wargame Alchemy, a new brand has developed the best product I’ve ever seen. Here’s the video showing how it works. Don’t loose the oportunity to get the best and safer product to remove the paint from your models!